Cyndie and I got a taste of the real thing yesterday. 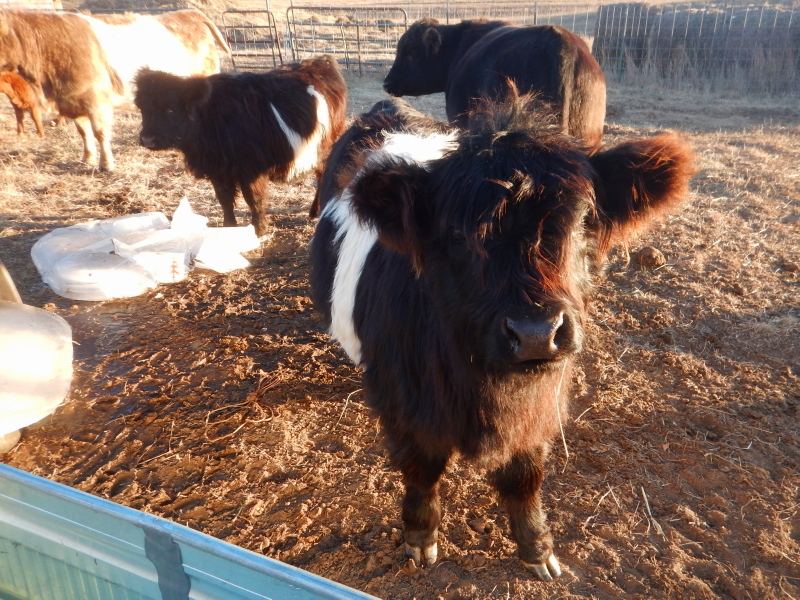 We visited George and Anneliese at Walker Farm this weekend. (Renee and Jeff, we waved in your direction as we drove by!) The real farming aspect started before we even reached the highway leaving our place on Friday afternoon. 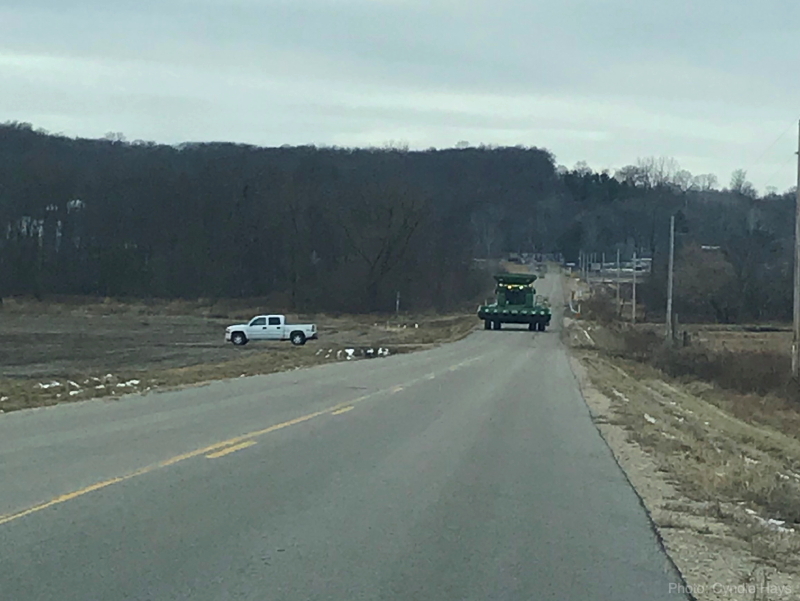 On a section of one of our county roads with barely a shoulder to speak of, we came face to face with a combine that almost filled the full width of both lanes. I hoped he was planning to turn into a field, because I had run out of turn-off options, but that rig just kept coming right at us. Moving the car as far to the right as I dared, I came to a complete stop. He moved as far as he dared to his right and squeaked by us with an uncomfortably small amount of clearance. It is harvest time and farmers are working like crazy to finish before winter weather stops them for the season. Yesterday morning, I started the day before dawn with George, trucking a load of soybeans down to a grain terminal in Savage, MN. That was a first for me, doing a walk around inspection of a big rig, copiloting our way to the terminal, and feeling the cab shake as the beans roared out of the hopper. We got back to the farm just as Cyndie and Anneliese were finishing up with chores to feed and water the cows, turkeys, and chickens. We were just a few days too early to witness the processing of about twenty Thanksgiving turkeys. After breakfast, we herded a bull and one heifer onto a trailer to be moved to a neighboring farm, then drove to a different neighbor to pick up another recently purchased heifer. The choreography is done as a means to control breeding possibilities of specific cows. Sometimes, controlling access is done to avoid breeding, and sometimes it is intended to encourage it. Those separated for the winter may have a chance to meet again in April. In the afternoon we walked the fence line to look for a reason the electric charge was being loaded down. We discovered a section by the road that appeared to have suffered impact from a vehicle. After several of the seemingly obligatory walks back and forth to the shed for additional parts or tools, we restored the integrity of the wiring to George’s satisfaction. We finished in the nick of time, as the sun soon dropped below the horizon. 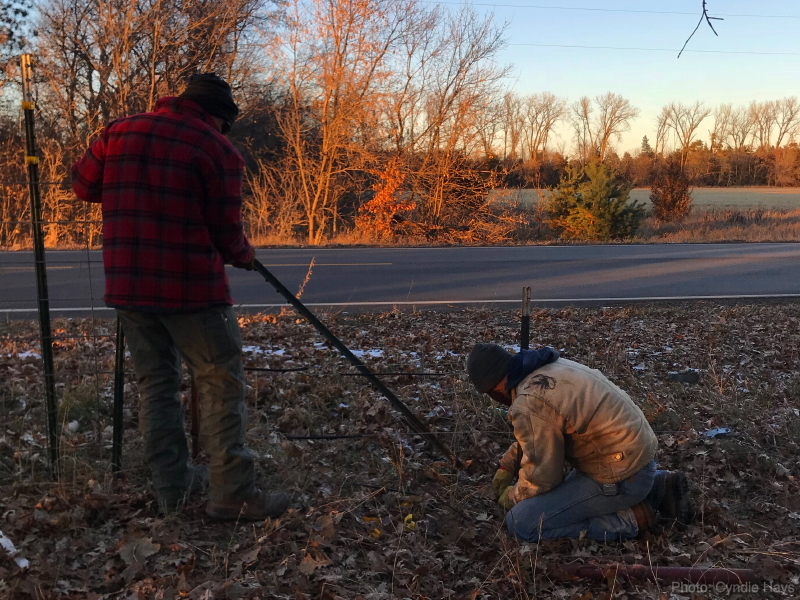 Despite the sun shining most of the day, the cold temperature stung after standing out in it for very long, so we were ready to be done. 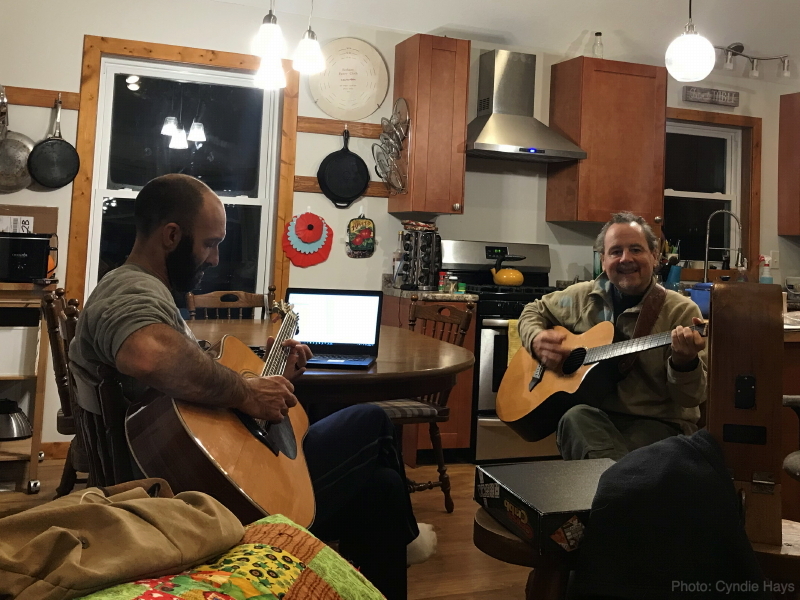 That made it all the more satisfying to be inside and warm for dinner, some card games, conversation, and eventually, making music. 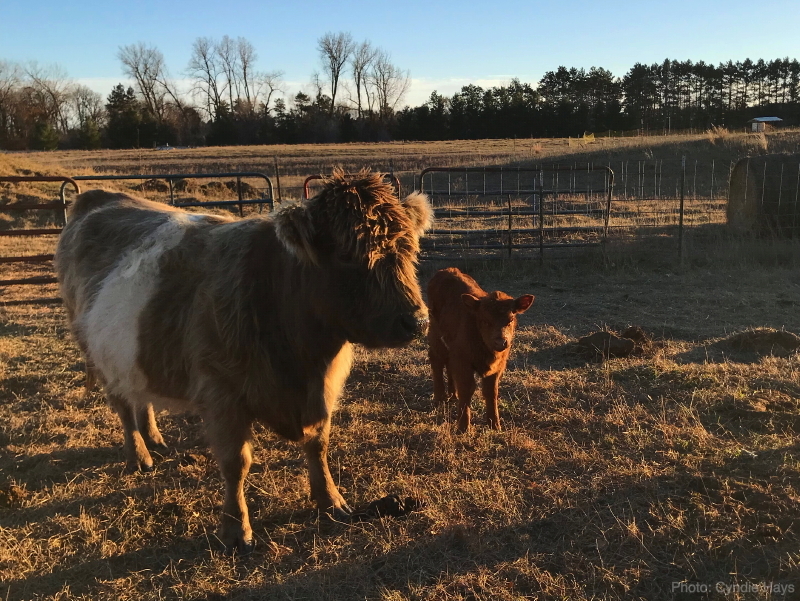 We were spending time with friends, but at the end of the day, I had this strange feeling we were also experiencing what it might be like if we added a couple of cows to graze our pastures someday. Could it be, that we were given a glimpse of our possible future? My wife wants a pony for our grandson, she also has expressed an interest in goats, my daughter wants some Scottish Highland Cattle. I just ask who is going to build the fence and insure the integrity of the fence? Who is going to care for these critters? Plus a few other questions. No answers as of yet. Cute. Yeah, just a few questions. It’s all so romantic, until you actually have to address the myriad nitty gritty details required. I forgot to throw in peacocks and maybe chickens which others have brought up as well. Well, of course. Logical additions, all! I’ll throw my vote in for chickens. Would your dogs be able to see them as NOT to be messed with, if you went free-range chickens? They are such a fun addition to the landscape!